What has up to now been the "Wildcard Rematch" is now (and from this point forward) an open field. 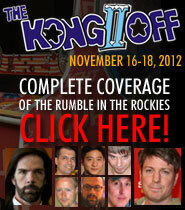 Organizers Eric Tessler and John Salter decided at the last minute to open registration to all Donkey Kong players, including the "Top 12" competitors, who were excluded from the first two tournaments. 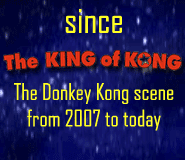 The decision was made in order to allow players who are already in the Top 12 to establish a qualifying "wildcard score" to lock in a spot in the Wildcard Division in the event that they get knocked out of the Top 12 by the time of the Kong Off 3. To absolutely nobody's surprise, once registration for the Top 12 was lifted, Dean Saglio entered, and easily took first place, proving once again that the only Donkey Kong player who can beat Dean is Dean himself. Also unsurprisingly, Phil Tudose took second, while also achieving a new personal best and breaching the "million fifty" mark for his first time. Fear Phil. Ben Falls came very close to a first-man kill screen, surviving all the way from 1-1 through 20-4 (108 boards). He certainly earned the "first man" bounty. Twitch TV was down on Friday night, causing a delay in the start of the tournament to 9 AM PST and prompting another last-minute decision to extend it until 9 PM—a total of 36 hours of play time. Top 12 player Dave McCrary has earned "wildcard insurance" with his score of 934,000. 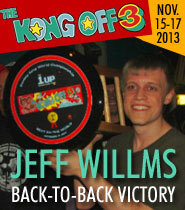 He will take one of the 8 spots should he lose his Top 12 status by the time of the Kong Off 3. The same is technically true of Dean Saglio, but Dean cannot lose his status. 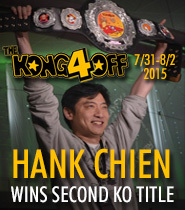 Coverage: Twin Galaxies tournament report.